An illustrated, step-by-step guide to repairs and upgrades Whether you want to prepare your computer for Windows 7, avoid investing in a new one, or just "go green", this fully illustrated guide has what you need. An illustrated, step-by-step guide to repairs and upgrades Whether you want to prepare your computer for Windows 7, avoid investing in a new one, or just "go green", this fully illustrated guide has what you need. You'll learn how to add printers and new keyboards, boost your PC's performance and increase memory, improve power consumption, rev up your multimedia capacity, and much more. Step-by-step instructions are accompanied by photos that show you exactly what you should see at every stage. 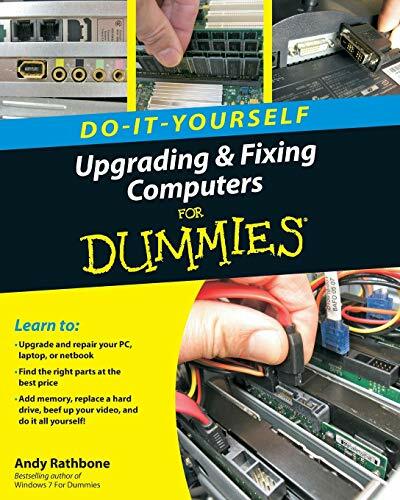 * Learn to perform basic upgrades and prepare your PC for high-speed Internet connections, network connections, and added security, all with fully illustrated instructions * Find out how to expand memory, enhance speed, and update your computer's power supply * Prepare an old computer for Windows 7 and beef up your capacity for multimedia Upgrading & Fixing Computers Do-It-Yourself For Dummies is a show-and-tell course in making your PC happy, healthy, and green.